Long exposure photography is a genre in photography that is often associated with fine art photography, due to the surreal and other worldly effects long exposure photography can bring to your photos. Of course besides that, notable fine art long exposure photographers like Michael Kenna, Michael Levin, Alexey Titarenko and Cole Thompson have been utilizing long exposure photography techniques in their work and that contributed to the association of long exposure photography with fine-art as well. Long exposure photography is also my favourite genre that I like to use in most of my work, mostly because of the surreal effect and also because it’s part of my personal philosophy on creating art by moving away from reality as many steps as possible to get closer to the individual essence of the artist. Parts of this section on how to do long exposure photography have earlier been published on my website www.bwvision.com in 2009 in a time that such detailed information on long exposure photography and how to practically do it was very scarce and only incidentally available as paid tutorials while the information on my website was completely free. After that many other photographers started publishing information on long exposure photography on the web or in another digital form. In the past four years long exposure photography has emerged as a very popular and almost mainstream form of photography. All this information previously available on this website has now been completely updated and extended with personal experiences and is now available in an even more extended version within the book “From Basics to Fine-art – B&W photography – Architectural Photography and Beyond” (released May 2014) that I wrote together with architect and fine-art photographer Julia Anna Gospodarou. But the book has more than what’s written here and which is commonly available on the Internet: it also includes a new approach to fine-art long exposure photography that I’ve called 5MF8. It’s the approach I always use in order to create the ethereal looking long exposure effects that you will see in many of my photos. 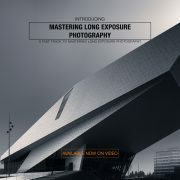 If you want to know more about that self-developed method to fine-art long exposure photography then go and buy the book! I will write “this book” or “this section” many times in this tutorial, referring to the original book version “From Basics to Fine-art”. In this long exposure photography tutorial I will go over the basics of daytime long exposure photography, the camera gear that you need and how to set up a long exposure shot so you can start shooting right away. I will also discuss how differences in exposure time can result in another look and feel when shooting architecture for example. Of course I will provide you with some long exposure photography tips and tricks as well. I’m emphasizing the fact that I’m talking about daytime long exposure photography here, as opposed to nighttime long exposure photography. For nighttime long exposure photography the same rules apply as to daytime long exposure photography, except that with nighttime long exposure photography you don’t need the ND filters that you would need for daytime long exposure photography, or at best ND filters with a lower density than with daytime long exposure photography. As a result, nighttime long exposure photography requires a different way of calculating the exposure time you need, to create the effects typical for long exposure photography. In the remainder of this article I will not use the phrase daytime long exposure photography anymore but will refer to it as simply long exposure photography when I’m talking about ND filters and calculating exposure times specifically. The effects in nighttime long exposure photography however are the same as with daytime long exposure photography but there are effects like the movement of the moon and the stars that you don’t have with daytime long exposure photography. In the near future I will extend this article with an additional part on nighttime long exposure photography. The main target group of this tutorial are daytime long exposure photographers since the majority of long exposure photographers seek to create the long exposure effects during daytime. 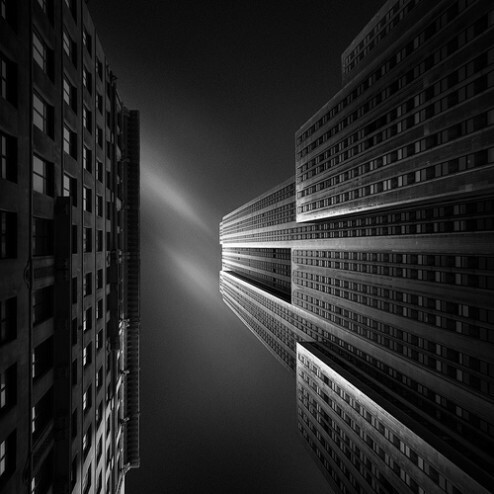 Keep in mind that a photographer like Michael Kenna for example is a typical nighttime long exposure photographer. 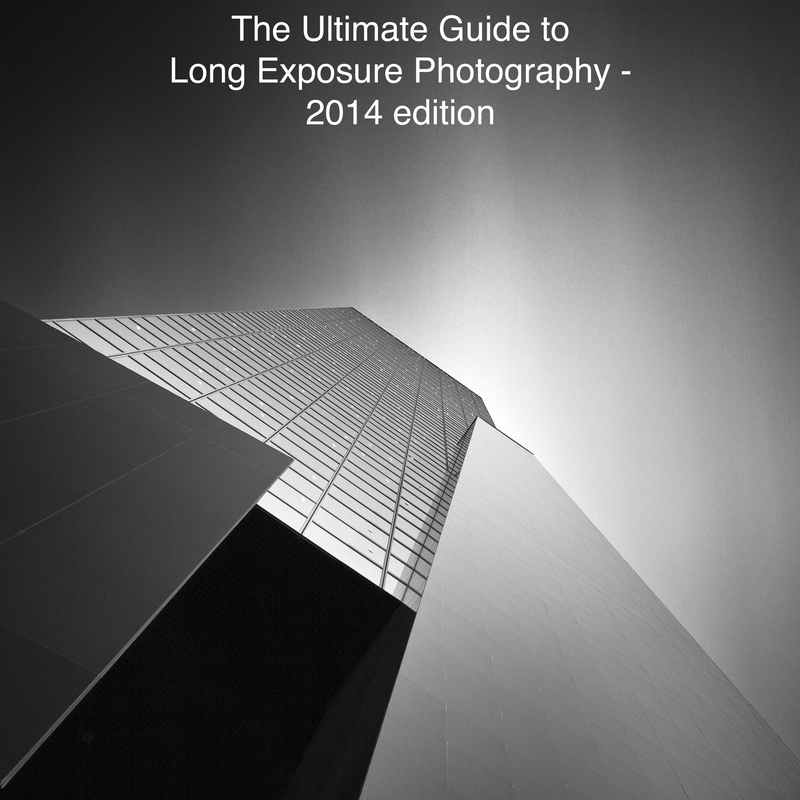 There is no generally accepted definition on what Long Exposure photography is but for the sake of clarity and for this article I want to use the definition and explanation in this book. Long exposure photography is taking photographs by using longer exposure times than needed to obtain a correctly exposed photograph, either during daytime with the use of filters or else during the night with or without the use of filters, with the deliberate intent to create an effect on any moving object that is typical for long exposure photographs. Effects like blurred skies with streaks of clouds, smoothed out water like if it was frozen, blurred ghostlike people, star trails, moon trails and light trails, using an exposure time that is deliberately prolonged to achieve this effect. This is a question people often ask me, especially those who don’t have any experience with it themselves. And there’s not just one answer but in my case it has everything to do with creating a mysterious, surreal atmosphere. About visualizing the invisible. An extended exposure can reveal to the eye what was visible to the mind’s eye only. That’s why I love long exposure photography: I want to reveal what my mind’s eye sees. And again, it’s part of my artistic philosophy to move away from reality as many steps as possible. As noted in the definition long exposure techniques can be utilized on any moving object. These are the most popular genres in which long exposure photography is being utilized but it is absolutely not limited to this. This is an example of long exposure photography for architecture. This is an image of the Empire State Building in New York City. For this image an exposure time of 316 seconds has been used with a total of 16 ND-filter stops. An example of long exposure photography to blur out crowds of people or to make them look like ghosts. 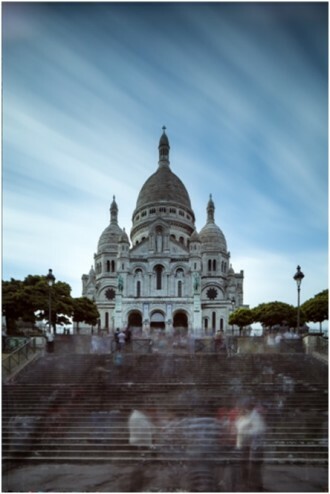 This is a photograph taken at the La Basilique du Sacré Cœur de Montmartre and is a work in progress. The exposure time is around 6 minutes and is taken with the Formatt-Hitech Prostop IRND filters, totaling 16 stops. Obviously you will need a camera. I recommend any camera that has a bulb mode. Most camera’s have a maximum exposure time of 30 seconds, which is not long enough most of the time for long exposure photography. The bulb mode allows you to go past that point of 30 seconds. Most models like the Canon 5D Mark III that I use have a dial with the B(ulb) setting that’s easy to find. If you have a brand that doesn’t have this explicit Bulb mode setting on the dials then most of the times it’s hidden somewhere under the Manual setting. Just dial in an exposure time past the 30 seconds and you will see the bulb mode. The sturdier the tripod, the better. I have used all kinds of tripod over the years and believe me: don’t buy the cheap knock-offs. In the end it will only cost you more money. Recommended brands are Manfrotto, Gitzo and Really Right Stuff. I use a Gitzo as my main tripod and have a Manfrotto 055XPROB as a backup. Ball heads – these are the most popular types and there are some very beautiful and heavy duty models from all the popular brands on the market in any price range. Recommended brands are Arca-Swiss and Really Right Stuff. If you buy one, preferably, make sure you have a so called Arca type quick release so the plates that you have for your camera will fit on other Arca type ball heads. This can save you money on the long run, especially if you want to extend your ball head with accessories like L-plates. Geared heads – there are just a few brands that have geared heads in their line of tripod heads which is a bit strange. This type of tripod heads have my absolute preference since you can very accurately fine tune the level on all axes with a geared head, which is absolutely not the case with ball heads. Often I get so frustrated working with ball heads and it can take me sometimes minutes to level my camera correctly with a ball head and even then it’s still not leveled. Using geared heads will save you the annoyance but the comfort and accuracy of geared heads come with a price. The best geared heads are from Arca-Swiss and the cheapest version, the D4 will cost you around $ 1,000. Their top model is the C1 Cube that will sell for around $ 1,700. Manfrotto also has a few geared heads that are between $300 and $500 but are often too bulky or simply not as robust as their Arca-Swiss counterparts. Besides these brands there are virtually no other manufacturers with geared heads. If you are an architectural photographer, then don’t bother the ball heads, go for the geared heads. In another section in this part of the book on long exposure photography I will explain why I prefer to shoot at day light with exposure times varying between 3 and 7 minutes. The only way this can be done during daylight is by using very dark ND filters of at least 10 stops. I use Formatt-Hitech Prostop IRND Filters, you can read more on them on the Formatt-Hitech website or on my website. (Edit December 2014: at this point in time I’m using the even more neutral Formatt-Hitech Firecrest 16 stops filter, read here all reviews on this filter) Basically you can choose between the circular ND filters and the rectangular filters. I have both of them and I tend to prefer the rectangular filters to the circular ones. Most of the times it’s easier to attach your filters to your lens using rectangular filters since you only have to slide them into the filter holder that’s attached to the front part of your lens. With circular filters you always run the risk that you accidentally adjust the focus on your lens when trying to screw them onto your lens. Furthermore the filter-holders can be attached to any size lens using an adapter ring. Filters that I prefer to use are the Formatt-Hitech IRND Prostop filters that come as rectangular and circular screw on filters and the B+W ND filters that only come as circular screw on filters. For long exposure photography no specific lenses are needed. Just make sure that if you use tilt-shift lenses to cover the lens with an old lens bag for example to prevent the light from leaking in through the lens. Tilt-shift lenses are usually not built for long exposure photography. Another important accessory is a remote that locks. If you manually press down the shutter button, the camera moves just a little bit which results in unsharp pictures. It really doesn’t matter if you buy a $ 300 dollar carbon fibre wireless remote or a simple $ 10 dollar no brand remote. It just needs to lock the shutter button. How is the weather? Are there enough relatively fast moving clouds? If you’re shooting architecture and there are no clouds then usually it’s no use shooting long exposure photographs. My preferred blue sky and cloud ratio for architecture is 60% blue sky and 40% clouds. For seascapes it’s more like 80% clouds and 20% blue sky. Preferably I shoot seascapes in between heavy rain showers with fast moving storm clouds. In general it’s no use shooting architecture with a completely overcast sky, but there are exceptions. The quality of the skies is more important with architecture than with seascapes since many architectural photographers like to point their camera straight up to the sky. 2. Now that you have found the perfect angle, you can set up your tripod and camera. Make sure your camera is tightly secured on your tripod head and the tripod head is tightly locked. 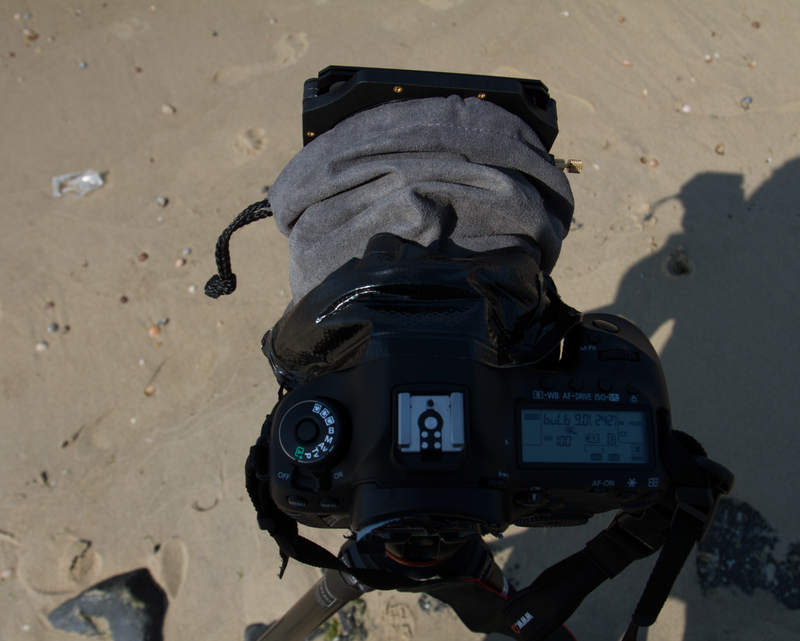 If it’s windy you could try to stabilize your tripod by hanging a weight like a bag with sand on your tripod. Every bit of vibration can result in blurry photos. 3. Once you have done that, set your camera to aperture priority mode and choose your settings. I recommend ISO 100 and f/7.1 or f/8, see also the section on 5MF8 in this book. Also make sure the lens is set to autofocus and turn off image stabilization if your lens has that option. If you leave it on, then your image will be unsharp and blurred, due to the image stabilization. Note: if you’re using a tilt-shift lens then you have to focus first and take a proper meter reading before you shift or tilt the lens. The meter reading with a tilt-shift lens will only be accurate if the lens is in the normal position and not shifted or tilted. 4. If you are all set up, make sure your subject is perfectly in focus and take a test shot in the aperture priority mode. I do this for several reasons. First of all, I want to know if the light that the camera measured was correct. Secondly, it serves as a reminder. The shutter speed of this image serves as the basis of the long exposure image. In case I forget, I can just look at the meta data of this image. Important: make sure that when you take a meter reading in the aperture priority mode that the viewfinder is properly covered and no light is coming in from the viewfinder. If you don’t do that then you will see that the meter reading is not as accurate as you wanted it to be and you will have an underexposed long exposure photograph as a final result. 5. Set the lens to manual focus and go into bulb mode. Use the same settings that you used in aperture priority mode. If you used ISO 100 and f/7.1, make sure that you use these same settings in bulb mode. 6. Mount the filters to the lens. After you’ve taken a meter reading and focused, I finally put the filters in front of the lens. Always in this order because the ND filters are usually so dark that the camera can’t measure any light with the filters on. Important: If you have a tilt shift lens then don’t forget to cover the lens barrel as well. And last but not least: cover the viewfinder against any light with the built-in cover, black tape or a hat. 7. 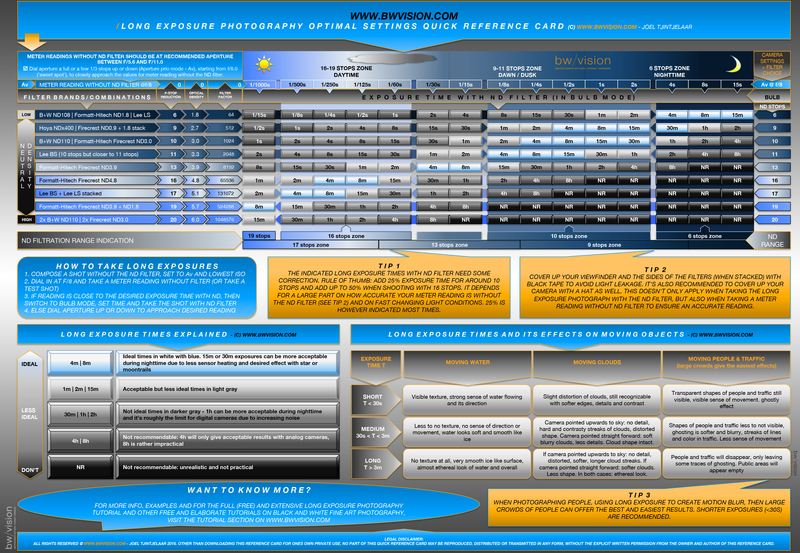 Calculate your exposure time using the chart below. Or, alternatively, you could download one of the many apps available now on the iTunes store. Tip: just download the free of charge calculators. If you forget the exposure time, simply go back to the shot you took in step 4. Note: even though you’ve calculated your exposure time correctly, most of the times it will come out underexposed. Often caused by incorrect meter readings while light leaked through your viewfinder. Imagine you would want to use a 6 stops ND filter. First you take a meter reading with your camera without the filter. Your meter reads a shutter speed of 1/500s. What shutter speed do you need to use with the ND filter? Go to the top row, this is your reference point. At this row, go to 1/500s. Go down in that column until you see a 6 on your far left in the F-stop reduction column. I highlighted this example in purple. You’ll see that you are going to need a shutter speed of 1/8s. For the lighter ND filters (until about 6 stops) this chart holds up pretty nicely. But if you use up to 16 stops then the recommended correction would be around 50% especially towards dawn when light changes rapidly or during other moments in the day when light changes fast. Tip 1: Always take notes while shooting. Make it as detailed as possible. What type of light (hard sunlight, moon shine, strobe, cloudy), what time of day, the subject, how did the sky look like, what shutter speed did your camera calculate, what shutter speed did you end up using, etc, etc. These notes will prove their use in the future. Tip 2: Take your time and carefully compose the shot – Don’t just shoot your subject but instead walk around a building first, look at it through the viewfinder, step forward, step back a bit, look at it again, take some normal exposure test shots, etc. Often it can take me up to an hour before I really start setting up my tripod and camera. After you’re quite confident of the shot you want to take, set up the tripod and camera – make sure it’s all levelled first. Then focus with auto-focus, switch to manual focus and do some additional focus correction. I do this with the live-view mode of my camera so I can zoom in to the object. Switch to Bulb, check all settings. Leave it on manual focus and start screwing on the filter very carefully or slide them into your filter holder. And then shoot! Always try to be as meticulous and disciplined as you can be. Take the time, it’s better to have 2 well composed and executed photographs than 10 failed poorly prepared and executed photos. Remember, often you need to wait for the right combination of weather, clouds and light, before you know it the ideal condition has flown into thin air. So make sure you’re prepared for that ideal condition. I’ve recently created a high resolution, downloadable and printable long exposure quick reference card with only the most used and most relevant information and tips and, what I also think, most optimal settings for long exposure photography. So instead of presenting a large amount of long exposure times, including useless and unrealistic times, I’ve only included the most relevant times and filter types. It needs to be mentioned that this is a quick reference card for beginners and also for more advanced long exposure photographers but it’s also designed for long exposure photography workshop instructors who want to give their students a (hopefully) easy to understand and portable quick guide to bring with them when shooting out in the field. Of course it doesn’t have all possible information. For example: I’ve only included exposure times and suggestions for the most commonly used ND filters and I’ve also only included the realistic exposure times with personal suggestions what the best exposure times are, depending on the time of day and light conditions. If for example, on one hand you live in an area with very bright light conditions and you only have a 6 stops ND filter then the best you can get at daytime is just an exposure of less than 1 second, which is not enough for the type of long exposure photography I propagate. But if you go out shooting at night on the other hand, then the 6 stops ND filter is very useful. 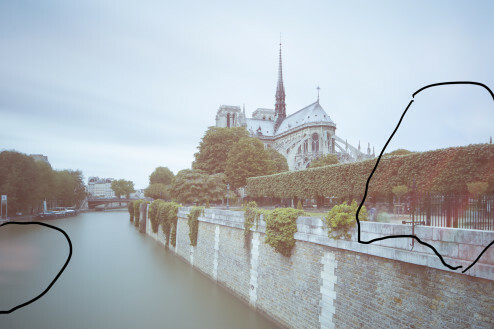 Another example: a 16 stops ND filter is great for any type of daytime long exposure photography (and a filter I use all the time) but it’s not useful for nighttime long exposure photography and a 10 stops is ideal when shooting at dusk or dawn or whenever light conditions are poor. What you can also see from the quick reference card is that a 10, 13 and 16 stops ND filter is the best set of filters to cover anything during daylight under any condition and part of the evening as well. This type of information will all be visible in the quick reference card and it’s the way I’ve designed this card. If you need to know more or don’t know how to start, then I would strongly suggest reading the full tutorial in this post first, then print this quick reference card and then go out shooting! TIP: right click on image and then ‘save as’ to download the high resolution 3.7Mb file. The exposure chart is of course just a theoretical chart: it assumes light conditions that are constant and stable over a longer period of time. It assumes that the moment you take a meter reading until the moment that you’ve stopped the exposure of a shot after 20 minutes or so, the light is still the same. Of course such ideal circumstances are very rare. Depending on the weather and the time of day, sunset or sunrise, light can change very fast. How should one deal with that? There are a few rule of thumbs, but keep in mind this is not an exact science, it’s still an art, a skill that you have to master with a lot of experience. The light during sunset is amazing, but the light also changes very fast. After you’ve calculated the exposure time it’s recommended to always add 25% to 50% exposure time, even in more stable light conditions. But the more accurate the meter reading, which is far more often the case when you cover your viewfinder, the less correction you have to apply. But if light is changing rapidly, close to sunset for example, then often I just double the exposure time. My bridge-vanishing-in-the-fog shot for example was calculated at 256 seconds and it was getting dark rapidly and there was a heavy fog. So I just doubled the exposure time during the shot. This is all a matter of experience especially in dynamic light conditions. But for more stable light conditions adding 25% if you use 10 ND stops to 50% exposure time, if you use more than 10 ND stops, is a good rule of thumb. Furthermore it is important to realize that there are no ideal light or weather conditions for long exposure photography. You have to deal with the circumstances you’re faced with. You can’t tell a client who invested a lot of money to fly you over, that the photo shoot is off because you don’t have the right weather conditions! Learn to adapt and to deal with any weather condition, with any light condition and make the best of it. Usually I prefer to shoot my long exposure seascapes in poor light conditions with a lot of clouds and cloud movement, never with a blue sunny sky. The light is just too bright and it will show in the photos with contrasts that are just too harsh. Besides that I think that shooting under a sky covered with clouds the light is more diffuse and can be controlled better by the photographer. It’s works like a soft-box in studio photography. Very often I shoot close to or around sunset when light is fading fast and I can shoot longer exposures to achieve a more ethereal effect. Shooting architecture is a different matter and I prefer to shoot architecture at bright day light with fast moving clouds and a blue sky to cloud ratio of 65% blue sky and 35% clouds. 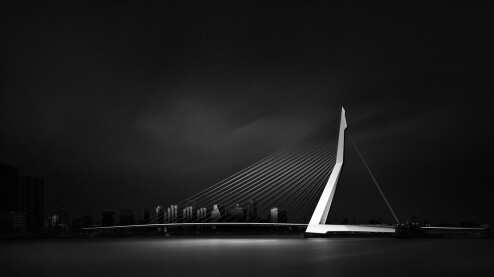 The Erasmus Bridge in Rotterdam, The Netherlands. Notice the ratio between the sky and the clouds. Clouds and blue skies. Very often the ratio should be 65% blue skies and 35% clouds. This gives me the best possible results. This also means that there will be lots of sunlight and 10 stops won’t be enough most of the times. You often want to shoot with apertures around f/8 or maybe even wider. No need for small apertures for architecture. You also want smooth streaks of clouds that don’t look too thick and hard but look smooth and ethereal and yet very recognizable as sharp streaks of uninterrupted clouds. Architectural photos with LE streaks of clouds that are interrupted due to shorter exposure times look messy and not aesthetical in my view. You need longer exposure times to achieve the best effects in the sky with the smooth, long and uninterrupted ethereal looking streaks of clouds: > 5 min. I prefer 6 minutes minimal. My ideal setting for LE architecture is approx. f/8.0, 16 stops, ISO 100 and 6 or 7 minutes exposure time. In another section of this book called 5MF8 I will go in more detail on the ideal long exposure settings. Too many times I’ve noticed that there’s still a large number of long exposure photographers who base their aperture setting on the preferred exposure time instead of basing it on the depth of field and sharpness they need. For example: a photographer only has 10 stops of filters and wants to shoot at bright day light with exposure times of over 3 minutes. Most of the times that is impossible and you would need 16 stops to do that generally speaking. Nevertheless they close down their aperture to f/22 to reduce the light even more, simply because they only have 10 stops of ND filters and never considered stacking filters to more than 10 stops. Resulting in photos that aren’t sharp enough with a lot of diffraction and even worse: visible sensor dust. Needless to say this is an incorrect approach. Always base your aperture on what you need for your photo, which is mostly around the sweet spot of the lens which is f/8.0 and not because you don’t have enough ND filters. It’s much better to buy yourself a set of additional ND filters to cover at least 16 stops. Ten stops of ND filters is not the rule, it’s a myth. If you’re a serious long exposure photographer then you need at least a set of filters comprising of a 10 stops, a 6 stops and a 3 stops filter to cover everything between 3 and 19 stops and to control any light condition. This especially holds true when shooting architecture. Please refer to the chapter on Dealing with weather and light conditions. There are many ND filter manufacturers, some produce only light ND filters, some produce a whole range of them. The filters come in different price ranges and in different sizes. Instead of listing them all here I think it’s better to just name the most important brands, my preferred filters and a few competitors. Formatt-Hitech – Formatt-Hitech produces filters for video and photography and has every filter you could possibly think of, including a great line of ND filters from 3 stops up to 10 stops, as circular screw on filters or as rectangular slide in filters, as separate filters or as complete, value for money kits. Formatt-Hitech’s state of the art line of ND filters are officially called IRND filters and are the world’s most neutral ND filters with a nearly flat attenuation of both visible spectrum light and infrared light. They are available as resin filters and as glass filters (only up to 8 stops). The Joel Tjintjelaar Signature Edition long exposure filter kit comes with a set of 3 filters: a 3 stops, a 6 stops and a 10 stops filter to give you the most commonly used combination for stacking filters. In practice this type of ND filters has a very neutral slightly cooler color cast that is easy to correct in post processing. The difference between regular ND filters and IRND filters is that ND filters are just Neutral Density filters while the IRND (IR stands for Infrared making it Infra Red Neutral Density filters) doesn’t have a specific infrared cutoff point, but has even attenuation all the way from UV, through visible spectrum, through near infrared and infrared. This results in a reduced color shift in the ND. The biggest result however is that the blacks appear beautifully crisp and (most importantly) black, rather than purple or magenta. *Update august 2014*: recently Formatt-Hitech released the sensational Firecrest IRND 16 stops filter, the world’s first 16 stops ND filter without any noticeable color cast or vignetting at all, not even in poor light conditions. I’ve tested it extensively here and more independent reviews here, and I was so impressed with the absolute neutrality of it. At this moment (August/September 2014) they’re only available as the Firecrest 16 stops as a rectangular slide-in filter that you can use with the Formatt-Hitech or Lee filter holder and as the superslim circular filters (stackable 5.5mm rings) available in the sizes 72, 77 and 82mm. Other densities such like 3, 6, 10 and 13 stops Firecrest ND filters and sizes will be available starting October 2014 in the JT signature edition kits. For the circular filters they will also become available as non-stackable ultraslim filters (3mm rings which makes them the thinnest filters in the world, ideal for ultra wide angle lenses and even less vignetting). If you want to purchase the Firecrest filters, then click here. B+W – B+W Produces some great filters that I’ve been using myself for years before Formatt-Hitech released their latest IRND filters. The B+W filters are available only as circular screw on filters in any size and up to 10 stops. It’s very easy to stack a 10 stop filters with a 6 stop filter for example, thanks to the filter thread on both the front and the back of each filter. B+W filters are very reliable and have a slightly warm color cast that is also easy to correct in post. Lee filters – for a few years the Lee filters have been one of the most popular filters on the market and pushed B+W from the number one spot in the ND filter market. Especially their so called Big Stopper 10 stops filter have been in demand widely. They’re only available as rectangular filters to be used with a filter holder that’s also provided by Lee. The Lee has a blue color cast which is also easy to correct in post-processing. The only major disadvantage of the Lee Big Stopper is that ever since their release in 2010 they were out of stock everywhere in the world and hard to get. Another disadvantage is the they’re not exactly 10 stops but more close to 11 stops. In 2014 Lee also released the Lee Little stopper with 6 stops ND filtration to easily stack them with the 10 stops to make it 16 stops. But taking into account that the 10 stops is more close to 11 stops you would actually have almost 17 stops of ND filtration which would require very long long exposure times – too long to my taste. Singh-Ray – Singh-Ray filters are among the most expensive filters in the market but they have a great range of filters. Until recently they didn’t have ND filters with more than 8 stops but they have hit back with their recent release of a 1o stops and even a 15 stops filter. Definitely something to keep your eye on. 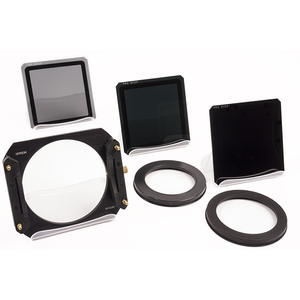 Singh-Ray also have a so-called Vari ND filter with adjustable stops varying from 1 to 8 stops. The rest – Don’t bother taking a look at the rest of the brands, they are relatively cheap but the quality isn’t up to par with the top four of filter manufacturers listed above. Although Hoya is absolutely a brand that produces some fantastic filters, especially Infra Red filters. Regarding the choice between screw-on filters like the ones from B+W versus the rectangular filter holder systems of Formatt-Hitech and Lee: I’ve always used the circular B+W filters until a few years ago when the Formatt-Hitech IRND filters were released, as there were no alternatives. Lee’s filter holder system was quite difficult to get and still is difficult to get your hands on since they’re always out of stock. These days with the Formatt-Hitech filters it’s much easier to have access to rectangular filters and I would definitely recommend using these. Having said this a rectangular filter system is more expensive than a circular filter system since you also need the filter holders for a rectangular system. A circular filter system might therefore be the filter you want. The approach when using circular filters is the same as with rectangular filters. The only difference is that you don’t need to screw on and off the filters from your lens and therefore running the risk that you accidentally change the focus on your lens that you just have carefully adjusted. Many photographers use polarizer filters also in combination with ND filters. The great thing about polarizer filters is that not only do they give a little color boost, but also reduces the light with 2 additional stops. There are two types of polarization filters: the circular polarizer (CP) and the linear polarizer (LP). There is some talk that a LP filter isn’t suitable for DSLR’s, it seems to disable the auto focusing of your camera and the built in light metering. I can’t say for a fact whether that is true or not. But why risk it? Just use a CP. Besides, most polarization filters are CP. Also know that the so called variable ND filters are based on the concept of 2 polarizing filters to reduce the light. It’s therefore recommended if you use a variable ND filter to not use it in combination with a polarizer filter because the outcome will be very unpredictable. A lot of people who use circular screw on filters will encounter the problem that one size doesn’t fit all. So your freshly bought 10 stops ND filter worth $ 100 or more, does fit your 82mm wide-angle, but not your 77mm zoom lens. There’s a quick and easy remedy to this: using step up/down rings. A step up/down ring is a thin ring that you mount onto the front of your lens. You can screw your ND filter onto the ring. You use this ring to fit a filter onto a lens that has a bigger diameter than the filter. For example: using a 58mm ND filter on a 77mm lens. These will cause vignetting. As stated here before: it’s a quick and easy fix. But don’t expect any miracles for that kind of price. Filter holders are used for rectangular filters only and are usually designed to be used with 100mm filters. The filter holder is attached directly in front of your lens using an adapter to fit any size lens. The filter holder can accept any adapter. 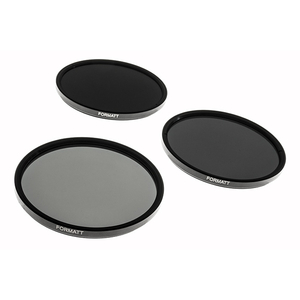 Formatt-Hitech and Lee filters both have filter holders in their range that are among the best in the world. For lenses with a bulgy glass compartment like the Nikon 14-24 it’s usually very hard to find a filter holder that can fit such a type of lens. Formatt-Hitech however has a filter holder that can also fit the likes of the Nikon 14-24mm lens by using Lucroit filter holders. Most long exposure photographers use multiple filters at once. They might use a 10 stops, a 6 stops and a GND. Using multiple filters at once is called stacking. There is nothing wrong with stacking. I even encourage this and I myself do a lot of stacking and it’s the only way to achieve a 16 stops ND filter. There’s however a disadvantage to stacking: vignetting. I can’t recommend using more than 2 or 3 filters simultaneously. Especially ultra wide angle lenses at their furthest reach encounter this problem. An example of light leakage. Click the image to see it in full size. 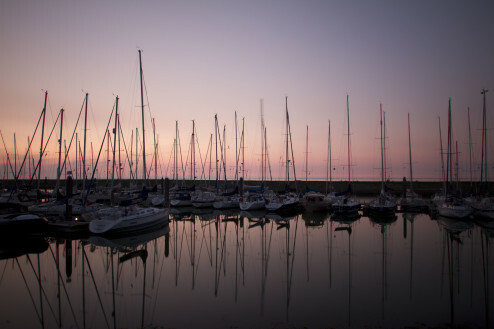 There are many long exposure photographers who suffer from light leakage that results in a magenta or purple like band of light in an image when shooting with a ND filter. This light leakage can be caused by several reasons. Your camera might be “leaking” light. Holes in your camera causes light to fall through it and mess up your pictures pretty badly. The longer the exposure, the more light falls through the holes and the bigger the color cast. Note: with holes I mean very small cracks, usually in the corners of your camera. Extreme light fall on your viewfinder. Never shoot directly into the sun when making long exposures. Don’t even shoot directly into the sun with very fast shutter speeds. It can ruin your sensor. However…it’s also bad to shoot with the sun directly behind you when shooting long exposures. Exposing your viewfinder to the extreme brightness of the sun for several seconds or minutes can also cause light leakage. Cover the viewfinder by standing behind the camera or use black tape to cover the viewfinder, while taking the long exposure. Unfortunately a very common side effect when shooting long exposure photos is that there’s more noise in your photos when exposure times increase. How to reduce noise and is it useful to use the built in Noise Reduction (NR) that comes with most modern DSLR’s? It’s a basic and physic rule that noise will increase with longer exposures. There’s a lot of literature on this subject available on the Internet but basically noise will increase in poor light conditions combined with longer exposures. There’s however a difference in how noise is handled by modern DSLR’s when compared with older model DSLR’s: modern DSLR’s simply handle noise better. There are many websites discussing this issue with some great examples and I surely can recommend reading Ken Rockwell’s excellent website on this subject. How to handle it in the field? Having a good camera doesn’t prevent noise in particular cases like shooting in very poor lighting conditions, or shooting with more than 10 stops. First thing to do is to try to avoid noise by shooting at the lowest ISO (100) and if there’s still noise it’s easy to just get rid of it by using noise reduction software. My favorite software for this is NIK Software’s DFine noise reduction tool. It works perfect for me and my photos look very clean. I never use the in-camera Noise Reduction functionality since I think, and with me other respected writers discussing this subject on the Internet, it is much more time effective to remove the noise in post-processing with for example Photoshop or with DFine from NIK software and controlling all parameters yourself instead of the camera. Besides that, and that is the most urgent argument to me: in-camera NR doubles the time of the exposure and since I usually shoot with exposure times of 3 minutes or longer this would increase exposure times for just one shot up to 20 minutes. This is not the place to discuss in detail here what in-camera NR does, but basically it takes another shot right after the regular exposure, with the shutter closed. This results in a dark frame with noise or hot pixels from the image sensor, that’s being subtracted from the original shot and thus removing the noise and hot pixels. This is called dark frame subtraction and you can read more on this on Ken Rockwell’s website for example. Careful preparation is an important aspect of especially long exposure photography since the nature of long photography is such that every shot matters and you will find yourself coming home from a day of shooting with just a handful of photos. Setting up just one shot usually takes up 15 to 20 minutes so time is of the essence. What I usually do is scout a location I find particularly interesting by using Google maps and/or Google Earth and just zoom in and look at it from various view points. At the same time I will search the Internet for photos of the environment and I try to find as many photos of a certain object in the area as I can possibly find. But not only photos, I also try to find other information in Wikipedia or any other source of a certain area or building I want to shoot. I also never forget to check the tides if I go out shooting seascapes. The type of location I find particularly interesting is based on my preference on a certain moment, often triggered by a photo I just saw on the Internet or a story I just read, you name it. This type of scouting and preparation usually takes me a few hours, sometimes even a few days but by the time I actually arrive at the location I just know where to go to, where to stand, what the ideal position is. Before actually travelling off to the planned location make sure to check the latest weather forecasts and when you shoot seascapes to verify the tides: you may want to prefer either low-tide or high-tide. So now you have all this information you should be able to go out and take some really great long exposure photographs. But what are the ideal long exposure settings? What is the ideal long exposure time? I’ve been shooting quite a lot of long exposure photographs and along the way I’ve also studied many of them from other notable long exposure photographers. What I have observed is that in general the longer the exposure time, the more delicate and soft the clouds and water look. The light is more diffused. It gives a more ethereal look to your photo and hence a more timeless and fine art look to it. This is the reason that I’ve started to take long exposure photographs with an exposure time of around 5 minutes or even longer. In most of the cases this requires at least 13 or 16 stops of ND filters, a 10 stops filter won’t do most of the times and the days that 10 stops filters were the norm, are over. What photographers mostly did when shooting with 10 stops is to shoot with smaller apertures up to f/22 to decrease the shutter speed. A major disadvantage of doing this is that there’s a lot of diffraction because of the very small aperture and even worse: every little bit of dust on your sensor or lens is immediately revealed. I always aim to shoot with the ‘sweet spot’ of the lens, which on average is around f/8.0, no matter the lens you use. You can read the rest on 5MF8, including a very convenient 5MF8 printable chart, in the upcoming book From Basics to Fine-art that will be available for a discounted pre-sale in February 2014. Or you can see all about it in my upcoming video that I’m creating with cinematographer Armand Dijcks, in which I will explain with visual examples how this 5MF8 method works. This video is now available with a temporary 20% pre-sale discount till the end of February 2014. Click here for more info on the video and here for ordering the video with a 20% temporary discount. – The best-selling book From Basics to Fine-art in collaboration with co-author Julia Anna Gospodarou for everything related to fine-art photography like: composition techniques, what is vision, what is fine-art, architectural photography and much more. – My new video tutorial ( released November 2014) on the evolved and updated version of my B&W post processing technique that now integrates luminosity masking into my iSGM method of processing to speed up the workflow and even give more control over your photograph. You can read about it here or purchase it here. It can be used as a stand-alone version or as an add-on to my older video tutorial B&W Long exposure Masterclass that you will find below. – My video tutorial on my personal Black and White Post processing technique called iSGM (released May 2013) in which I guide you step-by-step through my B&W postprocessing workflow in collaboration with FOTOTV.COM. You can order it here or read all the reviews on the videos here. – My video Exploring Vision for everything related to the vision aspect of black and white long exposure fine-art photography in collaboration with Armand Dijcks. You can read more about it here. 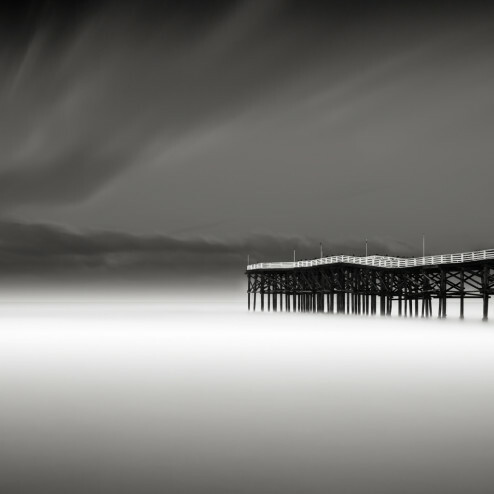 – A recently published blogpost by Kevin Choi from the capturethemoment.pics blog, on Long exposure photography, that features tips from Cole Thompson and Mabry Campbell to name a few. – A great tutorial written by my good friend Marc Koegel on long exposure photography on his blog bulbexposures.com specifically focused on long exposure photography. 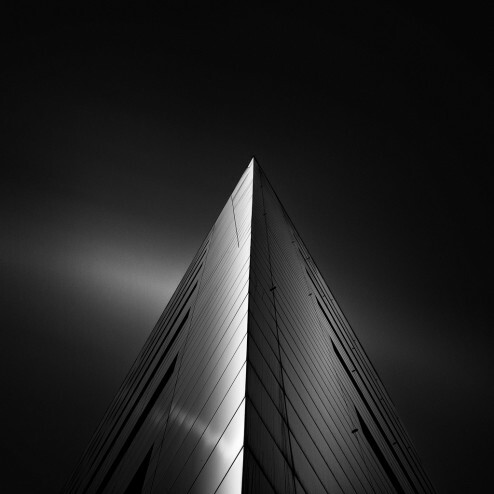 (c) Copyright Joel Tjintjelaar – BWVision 2009-2015. Nothing from this article may be published or copied without the explicit consent of the author.